The Hideout is small boutique surf & yoga hostel nestled away in a quite area of Pererenan, Canggu. It sits on a large piece of land in a beautiful garden. This property features 2 common areas, free fibre-optic Wi-Fi , self-service kitchen, Swimming Pool and a yoga shala. The air conditioned dorms boast the custom beds that each come with a night light and charging points. Our friendly staff are on hand to help you get the most of your stay and pass on their local knowledge. All the points make The Hideaway Hostel the perfect home away from home for those looking to surf, stretch relax. 1. Check-in Time: from 12:00 noon to 22:00. (2) If cancelled later or No Show, the full balance will be charged. 5. Age Restriction: The minimum age to check in is 16 years old. 6. Reception Hours: from 09:00 to 22:00. Love this place!! I kept extended my place. It such a cute lil hide out get away. Great staffs!! My favorite so far! LOVED staying at hideout! my other hostel (who shall not be named) didn't have space for me so I actually booked at HH last minute. like, about to leave the airport, 10PM last minute. the guys working at the spot were dope, Eddie and N especially. nice facilities, close to the beach, good food, good people, good vibes. free gym membership, yoga, pool, and also has a set of gymnastic rings for bodyweight workouts. can't beat it for the price. Great spot! Nice and clean and the staff are lovely. You're about a 15 min drive from the main beaches of Canggu but cheap scooter hire through the hostel. 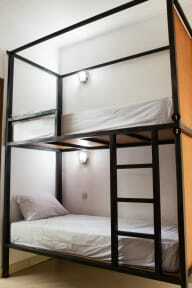 Perfect hostel for backpackers, easy to meet new people. Chillout area was really nice! A bit far from the city center, but they have really cheap scooter rentals, easy to get around. This hostel is really pretty and has a pool, hammocks and nice seating areas beanbags around the pool so is very relaxing. Has a really chilled vibe and everyone is friendly. Rooms were also nice and clean, the only downside I’d say is this hostel is a bit further away from everything walking distance but if you have a scooter then it’s completely fine! I wouldn’t stay here if you don’t have a scooter/don’t want to rent one - the location is nice but far away from most of the canggu action. Nice pod-like bunks and chilled but quiet atmosphere. No staff to help me with my problems. Room wasn’t ready in check-in time. Got a towel only in the evening because they didnt have a clean one. Location is very bad, 5-10 minutes driving with a scooter to the center of canggu. On the other hand, nice people and very good atmosphere.